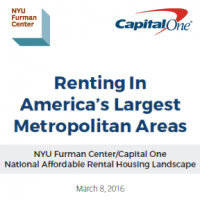 The 2016 NYU Furman Center / Capital One National Affordable Rental Housing Landscape (PDF) analyzes rental housing affordability trends in the 11 largest metropolitan areas in the U.S., including New York, Los Angeles, Chicago, Houston, Philadelphia, Dallas, San Francisco, Washington, D.C., Boston, Atlanta and Miami. The Landscape, commissioned by Capital One and conducted by the NYU Furman Center, was released on March 8, 2016. View a summary of key findings from the report. 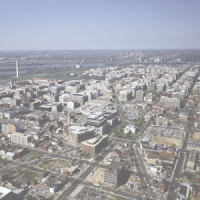 Download a printer-friendly PDF of the full report, including the national narrative and metro-area profiles. 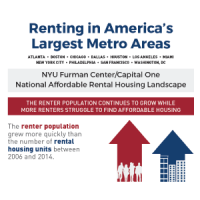 This infographic visualizes trends in rental housing affordability in the 11 largest US metro areas presented in the NYU Furman/Capital One National Affordable Rental Housing Landscape.